Greek police have fired tear gas at protesters angry at a deal to allow the country's northern neighbour call itself the Republic of North Macedonia. 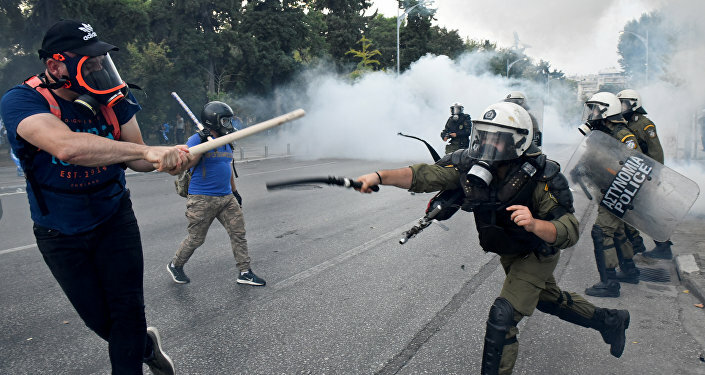 Youths wearing gas masks threw stones at police in the city of Thessaloniki, where Prime Minister Alexis Tsipras later spoke about his economic plans. Many Greeks say only the northern Greek region of Macedonia should use the name and not the former Yugoslav state. Macedonians will vote on the name change in a referendum on 30th September. Thousands of demonstrators reportedly took part in the protests on the streets of Thessaloniki, many of them waving Greek flags. Images and footage broadcast on Greek television showed riot police pursuing protesters as they ran alongside barriers ahead of Mr Tsipras's address on Saturday. Sputnik spoke to author Nikola Mirkovic about the protests and the upcoming referendum. Sputnik: What do you make of the protests? Nikola Mirkovic: I think it was an important moment for the political life of Greece actually, because at that specific moment Tsipras was making a very big speech at the opening of the fair, where the USA was the biggest guests this year, and at that same moment the Tsipras opposition wanted they disagreed with what he has been doing these past years and were using Macedonia as a pretext to go to the streets to show their opposition to Tsipras. Sputnik: Do you think the name change will go ahead after the upcoming referendum? Nikola Mirkovic: It will have a strong impact because for Greece, it won’t change a lot. It will for Tsipras that if the referendum goes by, that he is a good negotiator and he has been able to conduct the policy that was given to him by NATO and the European Union. However, for Macedonia it will change a lot, the opposition there is still strong. The way the referendum is formulated is scam in itself because it will ask, are you for EU and NATO membership by accepting the agreement between the Republic of Macedonia and the Republic of Greece? So it’s not just a referendum of the name, the first mention in the question is the EU and NATO, of so accept the name for Macedonia. There is a strong opposition in Macedonia now; the President has said he’s against the referendum, so it will change a lot. Sputnik: What will this agreement mean for the future of Macedonia in terms of NATO & the European Union? Nikola Mirkovic: What a lot of the Balkan countries are expecting is that by entering the European Union, they will get subsidies, they will get help, because most of the Balkan countries are quite poor today. They are hoping to get money to renew and renovate their hospitals, their universities and their roads. I think most of them couldn’t care less about NATO, as it doesn’t have a good image over there. But they are preparing themselves if that’s the price to pay to get these subsidies to try and have a better life in Macedonia, they will accept that. Views and opinions expressed in this article are those of Nikola Mirkovic and do not necessarily reflect those of Sputnik.